These Pet Rescue level 620 cheats and tips will help you beat level 620 of Pet Rescue. The objective of Pet Rescue level 620 is to rescue 9 pets and score 5,000 points. 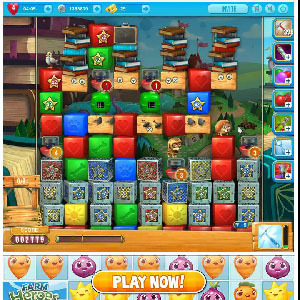 The board in level 620 starts out with little match potential due to the amount of obstacles on the board that break up the flow of blocks. However, you are given a balloon to help you out should you get stuck. Make what matches you can at first, so that you get the points, and when you run out of possible moves to make, use the balloon to keep the board moving. By the time you have burst the balloon, the board will have shifted downward to reveal more blocks to match with. Continue to make matches with an emphasis on keeping the board moving, because you do not want to run out of available moves or else you will lose the level. Try to last as long as you can until the column blaster boosters with the timers are set off and make more matching opportunity for you. The column blaster boosters should clear some of the caged blocks, and allow you to continue on down the board. Occasionally, it can be quite difficult to free a pet from its cage because it doesn’t happen to match up with any blocks or other pet cages on the board. Rather than waste time trying to match such a pet cage with an available block, you can speed up the process by using the block buster booster as soon as it becomes charged.